DreamMaker® Bath and Kitchen has a history of excellence, which consistently lands it on the Franchise 500 list as a top home improvement franchise. 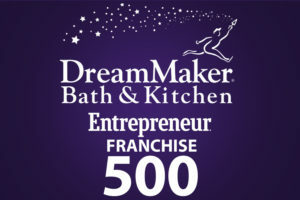 Entrepreneur magazine recently published its Franchise 500 rankings for 2017, naming DreamMaker® Bath and Kitchen as a top bath and kitchen franchise opportunity. This is the fifth time we have made the list and are proud to be recognized as a leader in the home improvement franchise category. DreamMaker® Bath & Kitchen is currently planning to add a significant number of new locations in the coming year. 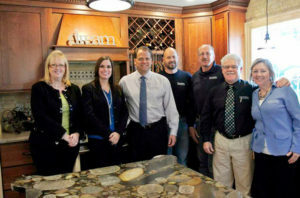 DreamMaker® Bath and Kitchen franchisees have seen average unit sales skyrocket 68% overall from 2011 to 2015. During the same timeframe, the overall remodeling industry grew 17.2%, according to the Harvard Joint Center for Housing Studies. The remodeling industry generates over $300 billion in annual spending, according to the Joint Center for Housing Studies at Harvard University — and the aging of America’s housing stock is expected to drive continued growth, which is great news for any kitchen and bathroom remodeling franchise. DreamMaker® Bath and Kitchen has consistently won awards for its exceptional franchise systems and customer service values. DreamMaker has been named Remodeler of the Year by Pro Remodeler, twice received the Guildmaster Award for Exceptional Service by GuildQuality, which recognized our superior delivery of customer care, and for the last three years, Franchise Business Review has awarded us the Franchisee Satisfaction Award in the Home Services category. DreamMaker® Bath & Kitchen’s proven systems help improve the sales process, the ordering process and communications both internally and with customers. Our systems also foster communication and friendships within the franchise system so that DreamMaker owners can learn from one another. Our systems are designed to help franchisees enjoy strong margins, good quality of life so that they’ll be able to eventually pass the business down to family or sell for a price that reflects all the hard work that was put into it. To find out more about DreamMaker® Bath and Kitchen’s home improvement franchise opportunity and our DreamMaker management team, download our free franchise report and start a conversation with us. You also can learn more by visiting our research pages.